This section discusses the sources and uses of cash generated from the securitized credit card receivables and how these cash flows are allocated within the securitization process. This section also elaborates on the use of finance charge and principal collections, their distribution in the event of an early amortization, the purpose of the revolving period and controlled amortization or accumulation periods, and the significance of excess finance charges. Cash flow in a credit card transaction begins when the cardholder transacts business with a merchant, vendor, or other participant in the credit card systems. The merchant or participant submits a claim for payment to the institution that issued the credit card21. The institution then pays the merchant for the claim and bills the cardholder for the respective charges, creating a credit card receivable. The cardholder then makes monthly payments on the account. Monthly payments vary from either the minimum payment as determined by the credit card issuer to full payments that pay off the entire balance owed on the card. This section uses the term "issuing bank" or "credit card issuer," which is referring to the financial institution that issued the credit card to the customer. The use of the term "issuing bank" in this chapter should not be confused with the accounting chapter where the term "issuer" referred to the securitization vehicle or QSPE trust who was the issuer of the certificates. The following discussion focuses on how the cash flows are allocated by the securitization vehicle's trustee to the investor certificate holders, the seller's interest, and the seller/servicer. Credit card receivables generate cash flows each month consisting of cardholder finance charges and principal payments. These cash flows are received by the servicer (who is commonly the selling bank) and immediately transferred to the securitization vehicle that was established for the securitization process. All collections on the credit card receivables are segregated by the servicer and distributed to the securitization vehicle as either amounts collected as finance charges or as amounts collected as principal receivables. The finance charges are defined by most pooling and servicing agreements and include interest charges, annual membership fees22, cash advance fees, transaction fees (e.g. overlimit and late fees), interchange fees, and any other fees charged to the cardholders for the use of the cards. Institutions are becoming more and more creative in the types of fees charged, as discussed in the accompanying Risk Management Credit Card Examination Manual. Examiners will need to review the pooling and servicing agreements to see what type of finance charges and fees are captured in the finance charge definition and how these are allocated. The term finance charges used in this section refers to all income (fees and finance charges) collected on the account as defined in the specific pooling and servicing agreement. During the life of the series, the finance charges are allocated on a pro-rata basis between the investor certificates and the seller's interest. As mentioned, the most common type of trust used in the current industry is a master trust. The finance charges allocated each month to the investor certificates are used to cover monthly trust expenses, usually in the following priority: investor coupon payments, servicing fees, and defaults on principal (losses). Cash flows also may be directed into various accounts, such as reserve accounts or spread accounts, to provide support against potential future cash flow shortfalls. Any remaining or excess finance charges (excess spread) that have been allocated to the investor certificates are typically released back to the seller/servicer at the end of each month. 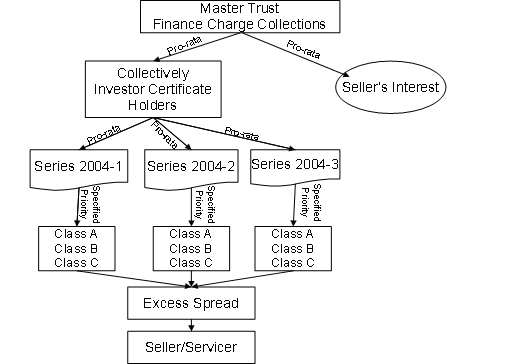 Again, it is important to understand that seller's interest is not considered sold, normally23 receives its pro-rata share of the finance charges, incurs its pro-rata share of credit losses, is not charged a servicing fee, and is not a component of the credit-enhancing interest-only strip (CE IO strip) calculation even though the receivables that represent seller's interests have been transferred (but not sold) to the securitization vehicle. This is an important concept to remember when evaluating the bank's calculation of the CE IO strip, which is discussed in the Residual Interest Valuation and Modeling chapter. Exhibit D further illustrates this point. The sum of the coupon rates paid on the investor certificates in a particular series and the servicing fee is referred to as the base rate. The cash flow available after allocation of the base rate and the trust expenses is known as the excess spread. The pooling and servicing agreement governs how excess spread is to be distributed by the securitization vehicle's trustee. Excess spread, which represents potential future income streams for the bank, is available to investor certificate holders to absorb credit losses and ensure performance and payment. The amount of prospective income from excess spread depends on factors such as finance charges on cardholder balances, annual membership charges and other fees, interchange income, net charge-offs, serving fees, cardholder payment rates, and coupon rates paid to the certificate holders. Excess spread is based on actual cash collected not on an accrual accounting concept, which is why delinquencies play a factor in the excess spread calculation. While delinquent accounts are not a direct deduction in the calculation, they do reduce the amount of finance charges collected and thus the excess spread since it is based on actual cash received. Finance charges and losses are the key points in assessing the stability of the excess spread and, thus, the volatility of the CE IO strip recorded on the bank's financial statements. Principal payments are also received by the servicer but are accounted for separately and fulfill different purposes during the life of a securitization. As noted in the Securitization Transaction (Overview) chapter, two specific periods exist during the life of a credit card securitization: the revolving period and the controlled amortization or accumulation period. The revolving period exists to allow the investor certificates to have a greater maturity than the underlying receivables. The holders of the investor certificates receive only periodic coupon payments during the revolving period. Following the revolving period, there is either a controlled amortization period, which allows for the timely and systematic distribution of principal payments to the investor certificate holders, or a controlled accumulation period, which allows for a bullet principal payment to the investor certificate holders at the end of the accumulation period. Principal payments made by the cardholders and submitted to the securitization trust during the accumulation period are deposited into a principal funding account. The principal funding account is invested as directed by the pooling and servicing agreement. The accumulation period may be a fixed or variable period of time, but must have a minimum length of one month. Principal payments collected on the credit card receivables during the revolving period and any excess principal receivables collected during the accumulation period are used to purchase new credit card receivables generated by the designated accounts, allocated to other series within the master trust, returned to the issuing bank, or a combination thereof. Performance and termination triggers are embedded in the structure of most credit card securitizations. These triggers are intended to protect investors against deteriorating credit quality of the underlying pool of credit card receivables by returning principal to the investors as quickly as possible. The most prominent credit card securitization protective trigger for investors is tied to the excess spread. The triggering amount and calculation can vary but, most commonly is based on the consecutive three-month average excess spread falling to or below zero. Decisions regarding early amortization, or wind down event, are made by the trustee or, under certain circumstances, upon a vote by the investor certificate holders. During an early amortization event, the revolving period ends and principal payments that have been allocated to the investor certificates26 are used to pay off the investor certificate holders as they are collected rather than used to purchase new receivables generated by the designated accounts. The time it takes to pay out the various classes of investors is a function of the payment rate of the underlying receivables. The principal received is distributed to the Class A certificate holders first until the Class A certificate holders are repaid in full, then to the Class B certificate holders until the Class B certificate holders are paid in full, and so on for any other classes issued in a particular series. Any cash flow deficiency owed to the Class A certificate holders on a specific distribution date reduces the credit enhancement facility, but not by more than the defaulted amount. Should the deficit owed to the Class A certificate holders reduce the credit enhancement facility to zero, the Class B investment account will be reduced by the deficit, but not below zero, and so on for any other subordinated classes. Should a cash shortfall still exist after all credit enhancements have been extinguished, the Class A certificate holders directly bear the credit and other risk associated with the undivided interest in the pool of credit card receivables. A discussion of how principal cash flows are allocated in a master trust with multiple series is provided later in this chapter. If a series goes into early amortization, there is an immediate liquidity concern. The securitization vehicle's trustee stops buying replacement credit card receivables since it is now required to use the principal payments collected to begin paying off the investor certificate holders. The credit card issuing bank now has to fund the new receivables without being able to subsequently sell them to the securitization vehicle. The bank has to either find a new funding source (internal and/or external) or start reducing the cardholders' line availability. The latter is not typically a viable option if the bank wants to stay in the credit card business. Longer term, the bank's reputation as a credit card originator or servicer is damaged and its revenue stream is impaired. Furthermore, longer-term liquidity and capital implications exist even if the bank can ride out the early amortization event, and the bank will likely incur a premium when it returns to the securitization market for future funding. Fortunately, early amortization events rarely occur. The following section provides information on the more common cash flow structures. It describes how the cash flow from one issue ultimately affects the early amortization risk of other series and can affect the income stream realized by the credit card issuing bank. A master trust is formed specifically to provide a flexible, cost-effective means of securitizing credit card receivables that is not available to a credit card securitization under a stand alone trust. The majority of credit card ABSs are issued out of master trusts. As noted in the Overview chapter, a master trust is set up to issue multiple series of certificates identified by specific issue dates and all backed by a single pool of credit card receivables in the master trust. The cash flow generated from all the receivables in the master trust are used to fund debt service payments on each series. As such, each series has an undivided interest in the receivables in the master trust. Most securitizations or series are issued with multiple investor classes, such as the Class A certificates (typically triple-A rated), the Class B certificates (typically single-A rated), and Class C certificates (typically triple-B rated). Many series have more classes, including one or more un-rated class held by the selling institution. The pooling and servicing agreement will dictate the required finance charge cash flow allocation for each class within each series, often referred to as the cash flow waterfall. In most cases, the pooling and servicing agreement will allow or require cash flow sharing among the various series in a master trust. In this situation, any excess finance charge cash flows in one series are available to cover any finance charge cash flow shortfalls in another series on a subordinated basis. Exhibit E (above) and Exhibit F (below) are illustrations of relatively simplistic structures. Structures used today by the major issuers have evolved into much more complex structures, but the concept of the cash flow waterfall remains. Nevertheless, it is often challenging to decipher. Prospectuses, prospectus supplements, and pooling and servicing agreements typically use flowcharts to illustrate the structure of the master trust and priority of cash flows. Exhibit F illustrates the concept of the cash flow waterfall. The example assumes three series are issued within the master trust and each series has three investor certificate classes (class A, B, and C). The example also assumes that the pooling and servicing agreement requires finance charge and principal cash flow sharing between each series. Finance Charge Cash Flows Allocated to Investor Certificates and Seller's Interest. Investor Certificate Allocated Finance Charges are Allocated on a Pro-rata Basis to the Series. Finance Charges Allocated to Each Series are Allocated on a Specified Priority Basis to Each Class. In Exhibit F, the excess finance charges on 2004-1 and 2004-3 ($958 and $263, respectively) are available to cover the shortfall on 2004-2. As such, a second cash flow allocation is made on a pro-rata basis to allocate the available excess finance charges to all series realizing a cash shortfall. The second allocation is based on the size of the available excess spread on all series within the master trust (for this example, the $958 plus the $263, or $1,221 in aggregate). As such, in the example, the $52 allocated from series 2004-1 to 2004-2 was determined by multiplying the 2004-2 shortfall of $67 by the percentage of the available excess finance charges attributed to series 2004-1 ($958/$1,221, or 78 percent). Series 2004-3, therefore, would cover 22 percent, or $15, of series 2004-2's shortfall. After the second distribution of cash flows, $1,154 ($906 plus $248) would be distributed to the seller. Some pooling and servicing agreements, however, require a portion of the excess cash flows to be allocated to the credit enhancement provider, usually a spread account, before being allocated to other series. Typically, when the excess spread of any particular series falls below a certain threshold, the cash flow received by that series is trapped in a series-specific spread account. If the excess spread on this series then becomes negative, the series-specific spread account makes up the shortfall. The series-specific spread account is replenished by drawing on any surplus excess spreads in other series. If there is still not enough excess spread to meet the contractual requirements for funding spread accounts at this stage, the available excess spread is allocated pro-rata to the series' invested amounts. Finance charges from one series can only be shared with another after its own requirements have been met. Examiners need to understand the cash flow allocations for each master trust as specified in the pooling and servicing agreement and determine whether the bank is adhering to the requirements as servicer and when applying its valuation models. Ideally, the bank should provide a flow chart depicting how the cash flows are to be allocated for each possible scenario. In addition, examiners should verify that the cash flow valuation models appropriately capture the required cash flow allocations. This concept is discussed further in the Residual Interest Valuation and Modeling chapter. The sharing of finance charge collections does not negatively affect the series experiencing excess finance charges, and series with insufficient finance charge cash flow are positively impacted by the subsidies they receive. However, any series receiving a subsidy (cash flow) from another series is subject to credit, variable-rate, and amortization risk. Credit risk is the risk that the credit quality of the pool of credit card receivables will deteriorate and cash will not be available to support the series. Investors benefit from short-term subsidies where a series' expenses temporarily exceed income and a draw on the credit enhancement is averted. However, if the credit quality of the underlying credit card receivables is deteriorating (due to higher charge offs or lower yields), the increasing size and chronic nature of subsidies may ultimately require a draw on the credit-enhancement facility, possibly triggering an early amortization event. Variable-rate risk results from differences in the timing of rate changes and cash flows in a transaction. A master trust may contain series that have fixed- and variable-rate investor coupons. If the underlying assets are fixed or are tied to a lagging index, then those series with variable-rate investor coupons will realize less cash flow during upward swings in market rates, thereby reducing the subsidy available to other series or even requiring its own subsidy. Conversely, if the master trust contains series that have fixed-rate investor coupons, but the underlying receivables are variable rate, those series with fixed-rate investor coupons will realize less cash flow during downward swings in market rates, thereby reducing the subsidy available to other series or requiring its own subsidy. Amortization risk arises when series providing subsidies to higher-cost series are in their controlled amortization or accumulation period. Since either the size of the amortizing series decreases or funds are placed in lower-yielding principal funding accounts (accumulation), finance charge income, and thus the amount available as a subsidy, is reduced. The shorter the controlled amortization or accumulation period, the quicker the subsidy dissipates. Additional support from newly-securitized series would be necessary to sustain the subsidy being provided to the higher-cost series; otherwise, a draw on its own enhancement facility would be required. During the revolving period, principal collections are used to acquire new receivables from the credit card issuing bank. In a master trust, it is common to have some series in the revolving period while others are in the controlled amortization or accumulation period. Principal collections are distributed to each series in relation to all outstanding series in the master trust. The pooling and servicing agreement will state how the principal collections are allocated. For example, if there is a $4 billion master trust with four, $1 billion series issued, cardholder principal payments collected each month will be allocated pro-rata to each series. In this example, each series receives 25 percent of the principal collection and the seller's interest receives 25 percent. Excess principal collections are generated during both the revolving period and the controlled amortization or accumulation period if principal collections exceed the amount required for distribution to investor certificate holders. The pooling and servicing agreement will designate excess principal receivables as being either available or unavailable to other series. If available, excess principal receivables are distributed to other series within the master trust during their controlled amortization or accumulation period. Excess principal receivables not available to other series is conceptually identical to a stand alone trust where the allocated principal collections for a series cannot be shared with another series to either cover a principal cash flow shortfall or reduce the accumulation period. This type of allocation is less common today. Excess principal receivables available to other series are by far the more common principal allocation method. This allocation method allows the excess principal collections of one or more series to cover principal cash shortfalls occurring in other amortizing series. However, the availability of funds to purchase newly-generated receivables diminishes when principal collections are shared within a master trust. As with finance charge collections, principal sharing is only allowed after the series has met its own requirements. Another important feature of principal collection sharing is that the sharing of principal collections can significantly reduce accumulation periods. Seller/servicers attempt to have as short of an accumulation period as possible since the funds held in the principal funding account are invested at lower yields than what is generated by the underlying credit card receivables, thereby reducing finance charge cash flow. By shortening the accumulation period to a few months, issuers can minimize the negative carry typically incurred on the high-quality, short-term investments. Since there are usually many series outstanding at any given time within a master trust, larger issuers have been able to reduce accumulation periods to as short as one month. Continuing the previous example, assume the $4 billion master trust had only one series issued for $1 billion and a principal payment rate of 15 percent. The pool of receivables generates $600 million in principal collections each month. The series issued has a 25 percent interest in the pool of receivables and therefore receives 25 percent of the total $600 million collected, or $150 million each month. In this scenario, the accumulation period would last for approximately seven months. Now assume there are two series issued, each totaling $1 billion, with the same principal payment rate assumption. Further assume one series is still in the revolving phase while the other is in the accumulation phase. When principal sharing is allowed, the $150 million in principal collections allocated to the revolving series each month can now be shared with the series that is in its accumulation phase. With the aggregate amount received each month increased to $300 million under this method, the accumulation period is reduced to four months29. The principal allocated to a particular series may be greater or lesser than the principal collections needed. For a series in a scheduled or controlled accumulation phase, the principal collections needed are based on the contractual obligation to pay down the investor certificate holders or fund a principal funding account for the benefit of the certificate holders. For a series in an early amortization, the need is the entire investor certificate amount outstanding. In an early amortization event, principal collections are allocated in order of seniority of the investor certificates in a given series, with the Class A holders paid first until they are completely extinguished, then the Class B holders receiving principal collections until they are paid in full, and so on down the class hierarchy. An early amortization event triggered in only one series could impact all series in a master trust since all series are collateralized by the same pool of credit card receivables. All series would suffer from deterioration in the performance of the credit card receivables with any differences attributed to differing coupons. When an early amortization event occurs, all principal collections are applied to the affected series based on a pro-rata basis regardless of their original maturity or whether or not they are in a revolving or accumulation period at the time of the early amortization event. All series in a master trust have both an expected final payment date and a series final termination date. The expected final payment date is the date the seller expects the final payment of principal and interest to be paid to the certificate holders. A final termination date is the legal date when the final payment of principal and interest must be paid to the certificate holders. The final termination date is usually much later than the expected final payment date thus allowing the seller, and sometimes the certificate holder, to extend the revolving period and/or the controlled accumulation period. Since the master trust normally allows for flexibility in sharing principal receivables, the seller can structure securitization activities to keep certain series revolving while other series are in the controlled accumulation period. This enables the seller to use excess principal collections from revolving series to cover potential principal cash shortfalls in amortizing series. However, the risk inherent in that situation is that the series in the revolving period could start amortizing concurrently with other amortizing series thereby eliminating or lessening the amount of subsidy available to the series with the principal cash shortfall. In these types of structures, the expected final payment date is based on the expected principal collections from all the series within a master trust rather than on the size of one particular series. This technique presents the risk that the actual principal collections on the entire pool of credit card receivables will be less than the expected principal collected, in which case the expected final payment date would not be met. Many securitizations are structured with variable controlled amortization or accumulation periods due to the uncertainty of principal collections being available to series with short amortization or accumulation periods. In these structures, a calculation is made at the start of the controlled amortization or accumulation period to determine the anticipated sources and uses of excess principal collections. The start of the accumulation period may be extended at the seller's option. Exhibits G and H are included in the prospectus supplement for Capital One Multi-asset Execution Trust's $1 billion Class A (2006-4) Card series Notes and are provided as an example to illustrate how cash flows are commonly explained or presented in the offering materials. Exhibit G relates to finance charges whereas Exhibit H relates to Principal. "Finance charge collections and other amounts allocated to the Card series, called Card series finance charge amounts, will generally be applied each month to make the following payments, deposits or allocations in the following priority: "
21 In reality, a merchant would submit the claim to a merchant processing bank (acquiring bank) that would then submit the claim to the issuing bank. The issuing bank then remits the funds to the acquiring bank that then remits the funds to the merchant. See the Merchant Processing chapter in the Risk Management Credit Card Examination Manual for further explanations of this process. 22 The treatment and allocation of annual membership fees vary and examiners need to review the securitization documents to determine how these fees are allocated. 23 Examiners should review the securitization documents carefully. In certain instances, the finance charges allocated to the seller's interest has not been pro-rata but a lower percentage if an early amortization event occurs. However, in such cases, as long as the credit losses are shared pro-rata, the seller's interest would not be considered a recourse situation for regulatory capital purposes. 24 Monthly yield (.15%/12) times the investors' certificates amount ($10,000,000). 26 Similar to finance charges, principal payments collected by the servicer and forwarded to the securitization vehicle are also shared on a pro-rata basis between the investor certificate holders and the seller's interest. 27 Finance charge cash flows are based on the size of a series in relation to the sum of all series in the master trust. 28 The specified priority is dictated by the pooling and servicing agreement. 29 Example from Deutsche Bank, "The Essential Guide to Credit Card As, Bs, and Cs." January 2001. 30 Prospectus supplement for Capital One Multi-asset Execution Trust's $1 billion Class A (2006-4) Card series Notes.